For all of you in the Ann Arbor/ Detroit area, a supporter of Special Days is holding a fundraiser for camp at their Hallmark Stores. 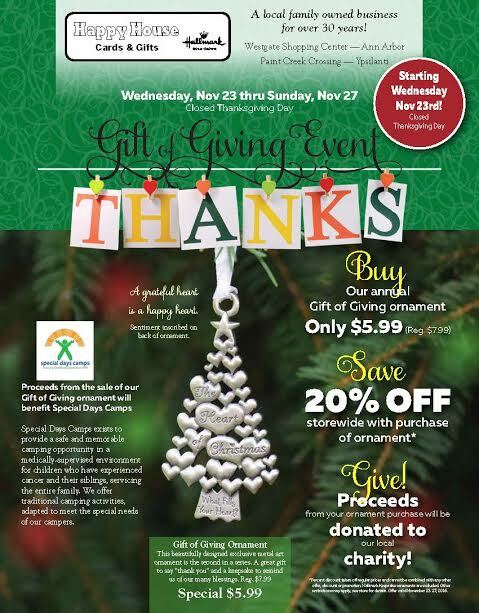 With every purchase of the Giving Ornaments, a portion will be donated to Special Days. Please come shop at this family owned store and share the love of giving this holiday season! Wednesday, November 23 – Sunday, November 27th at the Westgate Shopping Center (Ann Arbor) and Paint Creek Crossing (Ypsilanti) Happy House Cards and Gifts stores. We invite you to view this new video produced this summer and hear in the words of our campers, volunteers and staff what Special Days Camps is all about. We would like to extend our sincere appreciation to Cynthia Kay & Company Media Productions for their donation of time and services to make this project possible. 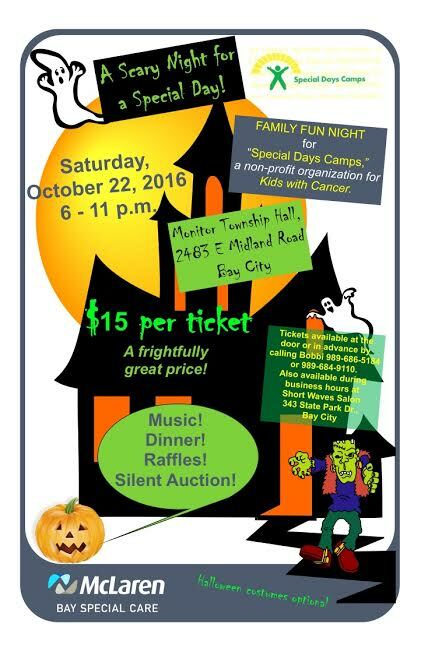 Join us in this family fun fundraiser benefiting Special Days Camps. Costumes optional but encouraged. Monitor Township Hall in Bay City. A great evening of fun, raffles, dinner and dancing. Call Bobbi for details 989-686-5184.